Toronto’s population is made up of diverse communities and groups. The City of Toronto values the contributions made by all residents and is committed to its motto, “Diversity Our Strength”. 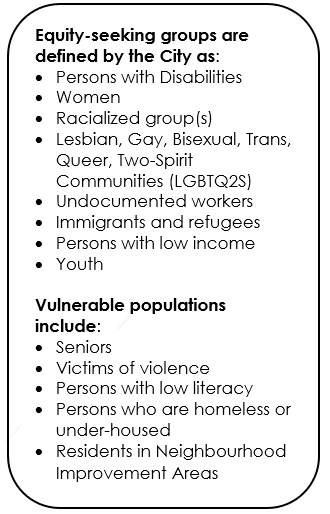 The City recognizes the barriers presented by discrimination and the disadvantages faced by equity-seeking groups and vulnerable populations. In particular, the City recognizes the unique status and cultural diversity of Indigenous communities and their right to self-determination. To address these barriers, the City strives to create and sustain equity in government to serve and reflect all people and implement positive changes in its workforce and communities to achieve access and realize equitable outcomes for all residents. The goal of these actions is to achieve inclusive and safe environments, free from discrimination, harassment and hate. To recognize the dignity and worth of all people, the City continues to improve the equitable treatment of community members and employees, and aims to provide services by consulting with communities and making sure everyone can participate in decision-making. City staff are developing a plan in 2019 to accelerate progress toward its goal of reflecting the diversity of the population it serves. Executive Committee will consider a report with a plan for accelerating the City’s progress toward this goal. The plan will include rolling out an inclusive hiring framework to provide tools and resources to support a diverse talent pipeline and improving the collection of diversity-related data to measure and evaluate the impact of diversity initiatives. The City will be rolling out training programs to City staff on Indigenous cultural competency, confronting anti-Black racism, and disability awareness so that City staff have the skills and knowledge they need to meet the needs of the public and create and maintain an inclusive workforce. For many years, the City has been at the forefront of promoting access, equity, diversity and human rights through innovative policies, programs and services that consider the needs of equity-seeking groups and vulnerable populations. Equity, Diversity, and Human Rights (EDHR) is developing strategies and undertaking work to identify current and emerging equity-related issues and creating relevant resources and supports to address gaps. In addition, EDHR consults with and advises City divisions on equity-related matters as they plan, budget and provide services and programs to residents. The City is applying an Equity Lens tool to assists in identifying and removing barriers for the City’s most marginalized and vulnerable communities. The Equity Lens supports best practices in the development and evaluation of policies, services, and programs. It can also be used to conduct and generate an Equity Impact Statement, which is a requirement for all major policies and reports to City Council. The City recognizes that building an inclusive workforce that reflects the population it serves at all levels within the Toronto Public Service (TPS) will promote public confidence and ensure that its decision-making processes include a range of perspectives. Accordingly, diversity is one of four strategic focus areas in the City’s five-year workforce plan, the Talent Blueprint. The City’s Employment Equity Policy directs the City to conduct a voluntary workforce survey, Count Yourself In. The survey invites employees to voluntarily disclose how they self- identify. Questions are asked about an employee’s gender, racial and ethnic identity, sexual orientation, whether they identify as Indigenous, and as a person with a disability. 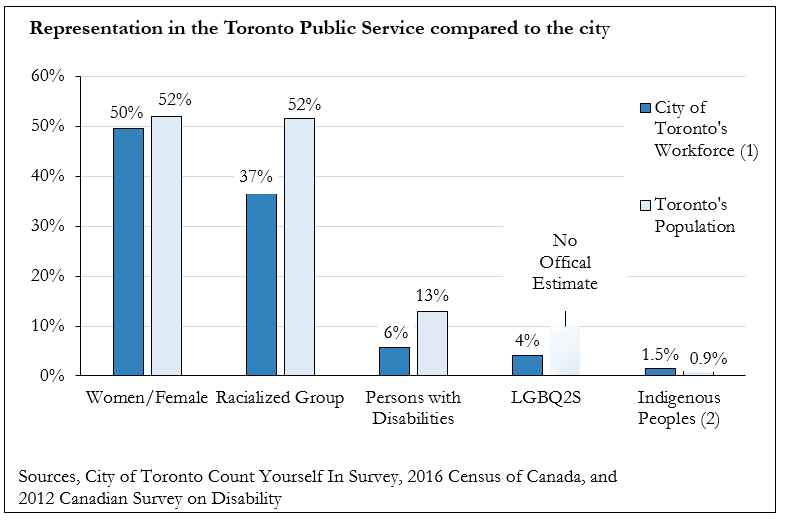 The survey data indicates that some progress has been made in advancing diversity within the City of Toronto. However, more work is required to achieve the goal of building a public service that reflects the diversity of the population it serves. Data is based on active TPS employees but excludes: Recreation Workers, Elected Officials and their Staff, Accountability Officers, and employees working in the City’s Agencies and Corporations. Official population estimates of Indigenous people are thought to be underestimates. Implement a Workforce Plan to create an engaged, diverse, high-performing, adaptive and productive workforce to meet the City’s current and future needs. Executive Committee directed City staff to develop a Persons with Disabilities Employment Strategy with the objective that Persons with Disabilities are employed at the City at a level reflective of their representation in the population of the City. June 2018 City Council adopted the City’s Corporate Accessibility Policy and directs staff to report to the Executive Committee in the second quarter of 2019 options to enhance accessibility through an accessibility certification program and the feasibility conducting a pilot of such a program on a City facility. The Disaggregated Data Strategy that identifies equity and human rights, privacy, and open government as the three key strategic principles that will be adhered to by the City’s. The Executive Committee adopted a report on Equity Responsive Budgeting, which provides an overview of progress towards incorporating an equity and gender analysis into the City budget process.